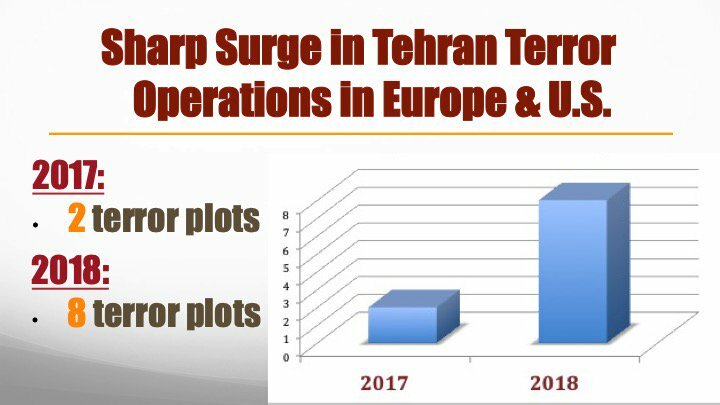 Sharp Surge in Iran-sponsored terrorist operation in Europe and the United States in 2017-2018, up from 2 plots last year to 8 terror plots so far in 2018; Tehran has revived its killing machine. 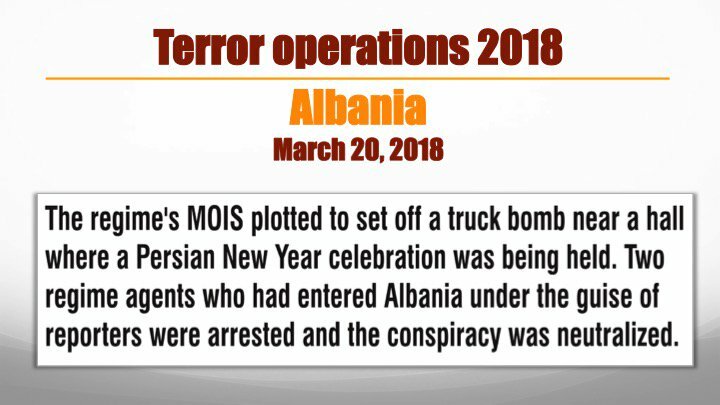 The regime's Ministry of Intelligence plotted to set off a truck bomb during a Persian New Year celebration in Tirana of 3,000 member of Iran's largest opposition movement, the MEK. 2 regime agents who had entered Albania posing as reporters were arrested. (1) Liam is either ignorant or grossly misinformed. "#GangStalking" is street slang for state-organized terrorism run through #ThreatFusionCenters under the guise of "legitimate" counter-terrorism ops. (2) #CMO or "Civilian Military Op" by the US Military itself. In reality, "Gang Stalking" is a sophisticated, tech-enhanced targeting strategy utilized by the US Gov against anyone that the #DeepState and its agency minions have marked as potential "dissidents" AKA "terrorists." (3) This extrajudicial targeting protocol is an AI-driven amalgamation of tactics derived from a variety of sources including the #Stasi, #KGB & China's anti-Falun Gong global targeting teams. The goal of these operations is to subtly terrorize and traumatize the target(s). Chairman Graham, Ranking Member Whitehouse, Members of the Subcommittee, thank you for the opportunity to appear before you today to discuss cyber threats. I would first like to extend my appreciation for your efforts to focus attention on cyber threats through such forums as this subcommittee hearing. 🚨🚨🚨Military tribunals are especially required to prosecute the Deep State criminals, rogue Intel & SS agents and Shadow Government perps who are conducting a soft coup against the POTUS. But why? U.S. Criminal Justice System, that’s why! Political reality throughout the USA is that the legal profession is overwhelmingly populated by card-carrying Democrats, liberal lawyers, progressive corporate attorneys, activist judges and left-wing DAs.